(Nanowerk News) Researchers at Columbia University have reported a new approach to visualize glucose uptake activity in single living cells by light microscopy with minimum disturbance. 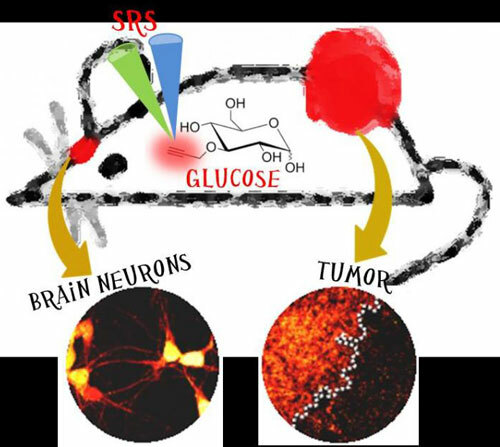 In a recent study published in Angewandte Chemie International Edition ("Vibrational Imaging of Glucose Uptake Activity in Live Cells and Tissues by Stimulated Raman Scattering"), Associate Professor of Chemistry Wei Min's team developed a new glucose analogue that can mimic the natural glucose, and imaged its uptake as energy source by living cancer cells, neurons and tissues at the single cell level. Glucose is consumed as an energy source by almost all life forms, from bacteria to human. The uptake of glucose by cells closely reflects their energetic needs, and is becoming poorly regulated in many pathological conditions such as obesity, diabetes and cancer. To visualize this important process, several prominent techniques have been developed in the past few decades. Radioactive fluorine-18 labeled glucose FDG is widely applied in clinical cancer diagnostics to locate metabolic hot spots in human body using positron emission tomography (PET). Magnetic resonance imaging (MRI) has recently demonstrated glucose imaging in mouse tumors. Although both methods find great use in clinical application, they do not have sufficient spatial resolution to visualize glucose uptake down to single cells. To image glucose uptake activity at the cellular level, glucose analogues labeled with fluorescent dyes have been developed. Unfortunately, tagging fluorophores onto glucose alters its chemical property. Moreover, fluorescent dyes are always larger than the glucose itself. Therefore, most fluorescent glucose analogues have undesired interactions in cells and tissues, which would bias the true glucose distribution. To overcome these problems, Min and his team developed a new modality to visualize glucose uptake activity inside single cells based on stimulated Raman scattering (SRS) imaging, and demonstrated its use in live cancer cells, tumor xenograft tissues, primary neurons and mouse brain tissues. Coupling SRS with alkyne tags has been reported earlier by the same group as a general strategy for imaging small biomolecules. Specifically, glucose is labeled with a small alkyne tag (i.e., carbon-carbon triple bond) to generate a strong and characteristic Raman scattering signal in the otherwise silent region, which can be picked up by SRS microscope with high sensitivity and specificity to produce a quantitative concentration map in three dimensions. This technique is able to distinguish cancer cell lines with differing metabolic activities and reveals heterogeneous uptake patterns in neurons, mouse brain tissues and tumor tissues with clear cell-to-cell variations. The border between tumor proliferating region and the necrotic region can be clearly visualized down to single cell with sharp contrast in glucose uptake activity. "By offering the distinct advantage of subcellular resolution and avoiding the undesirable influence of fluorescent dyes, we believe our technique can complement FDG in clinical PET imaging for visualizing glucose uptake activity at the cellular level", says the lead author Fanghao Hu, a Ph.D. candidate in chemistry. Currently, Min's team is working on applying this technique for imaging glucose uptake dynamics in mice. "We expect that our new method will become an attractive tool to study energy requirements of living systems with subcellular resolution", says Min, "especially in brain and malignant tumors that are in high demand of energy."